For optimal visualization during laparoscopic gastroesophageal procedures, the left lobe of the liver has to be mobilized superiorly to the anterior abdominal wall. To accomplish this task, we have traditionally utilized an externally placed stainless steel retractor. Retraction is either performed manually, or by a mechanical arm that is secured to the side rail of the operating table. This can be cumbersome and inefficient. Further, it requires a separate port of entry. We describe the use of a pliable self-retaining intracorporeal liver retractor in a Single Port Access (SPA) Heller myotomy. In order to elevate the left lobe of the liver without creating a separate port, a one-half inch Penrose drain was inserted through the umbilical port. The “Hepatic Sling” was secured superiorly to the diaphragm and anteriorly to the abdominal wall lateral to the falciform ligament. Metallic tacs were applied with a laparoscopic fixation device through the umbilical port. The sling proved durable, retracting the left hepatic lobe for the duration of the case without additional manipulation. Upon completion, the sling and tacs were removed. The patient tolerated the procedure well with no bleeding or post-operative complications. 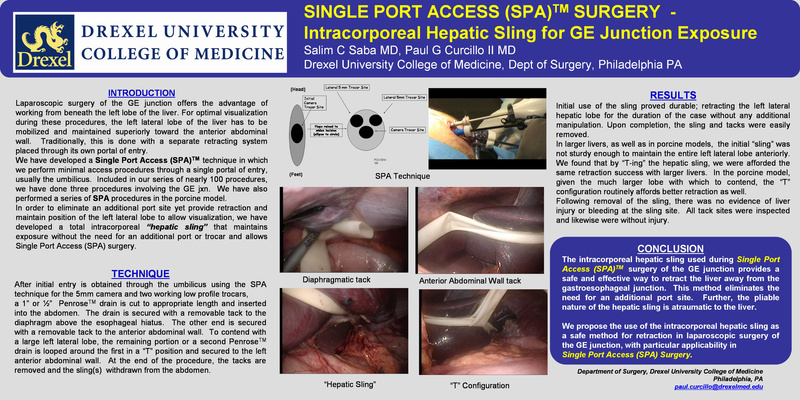 The intracorporeal hepatic sling provides a safe and effective way to retract the liver away from the gastroesophageal junction during laparoscopic surgery without the need for an additional port site. Moreover, the pliable nature of the hepatic sling is atraumatic to the liver. We propose the use of the intracorporeal hepatic sling as a safe and cost-effective method for retraction in laparoscopic upper gastrointestinal procedures.